Other names: Badhal, dahe, lakuch. Dheu is a native of India. 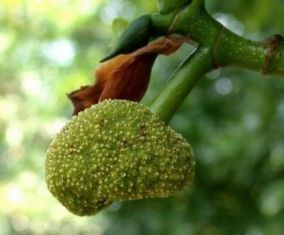 Its fruits are widely used in India for making a pickle. 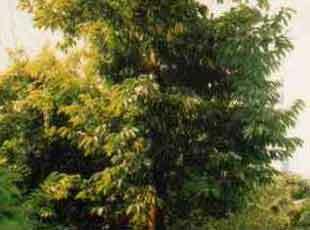 The tree grows wild in forests, common lands upto an altitude of 1800 m. Dheu trees are also planted for the fruits which are sold in market during the season. In its wild state it is chiefly found in moist or deciduous forests along the banks of streams along the sites of moist ravines. It thrives best in deep laterite soils. A large deciduous tree upto 20 m tall, spreading crown and clear straight bole. Bark dark brown, exfoliating in small round woody peels, reddish inside, softly fibrous with faint streaksof white latex. 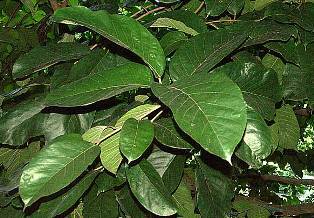 Leaves 13-37 cm x 6-21 cm, elliptic, oblong or ovate, base broadly cuneate, pinnatifid. Inflorescences solitary axillary, male head ellipsoid, perianth of 2 (or 3) free segments, bracts stoutly stalked. Female heads with styles exerted to 1.0-1.5 mm, through low papillae emerging between peltate bracts; syncarp 6-12 cm long, sub-globose, shallowly lobed, yellow drying brown, surface irregularly papillate, pubescent, with numerous persistent bracts; fruiting perianths several, fleshy, peduncle short pubescent. Seeds (pericarp with a thin horny endocarp) 10×6 mm. 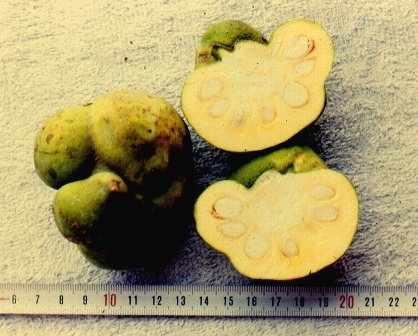 The fruit is much used for culinary purposes in India. In North India, unripe but unripe fruits are used in making a pickle on home as well as on commercial scale. Ripe fruit, which is sour, is used for chutneys. It is sliced, dried and used as a substitute for tamarind for those who are not supposed to take tamarind is forbidden during the course of medical treatment. The dried slices are used in meat and fish curries, particularly in West India.. These slices impart a very special flavour to the curries. Dheu bark s chewed in Assam as a substitute for betel nut. The wood is light, straight or interlocked-grained, very course and even textured. It is as strong as teak. It is popularly used for house construction work, medium weight furniture and boat building. So the commercial nurseries propagate it by marcottage. Such plants start bearing after 3-4 years. Root suckers are used for planting.